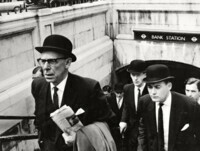 During the sixties London becomes the "Place to Be" in Europe. List takes its awakening literally and accompanies the city's preparation for the day with his camera. This slightly homogenous series taken in one day from the windowsill of a friends apartment marks a turning point in List work process. It is here that he utilizes a Leica 35mm camera with a telephoto lens for the first time. The small Leica camera becomes a new tool for him that influences his style in the following decade. 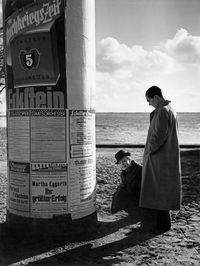 The beach and the street - show of 40 images which explores two of the main scenes that fascinated List throughout his photographic oeuvre. The panopticum in Vienna hosted on the site of the Wiener Prater an encompssing collection of wax figurines. The series was produced in 1944, shortly before the collection was largely destroyed by a fire.